Junk is no one’s friend. None of us can stand having junk in our lives, cluttering up our homes and minds. The great people of Tennessee are no exception and that’s exactly why they have fallen in love with The Junk Bucket Dumpster! The Junk Bucket is the perfect solution to all your junk, debris and clutter issues. You can leave this beautifully designed, ascetically pleasing, baby blue dumpster outside of you home or office as long as you need. Filling it up with junk and other unwanted items at your own personal pace. Junk Buckets are perfect for all different types of junk and clean out projects. Cleaning and clearing all the junk from your garage? Use a Junk Bucket. Doing some home renovations? Use a Junk Bucket for the excess debris. Moving? Trust me, you’ll need a Junk Bucket during the entire process. 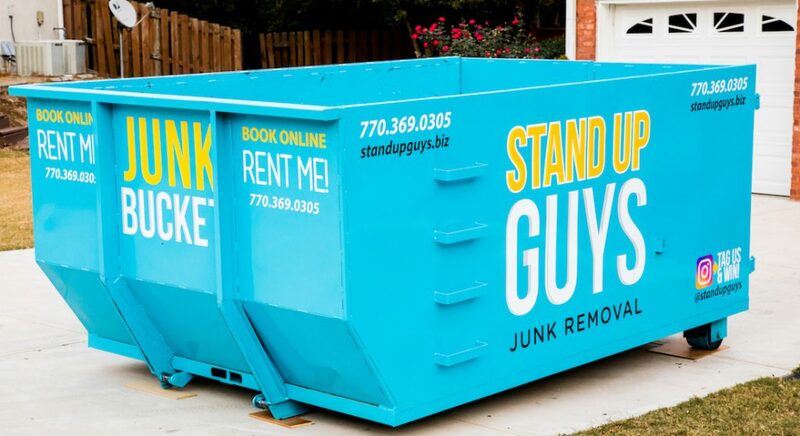 Whatever your junk needs, the Junk Bucket is a perfect solution to your problem. Junk Bucket Dumpster Rentals in Tennessee are as easy as a Tennessee Pecan Pie. All you have to do is pick up the phone and give us a call at 615-647-0634 and let us know what day and time works best for you. At the time that YOU requested, two of our uniformed professionals will arrive at your home or place of business and drop the Junk Bucket wherever you like. Then all you have to do is start filling that bad boy up. Once you do that, holler at us again and we’ll be by to pick it up and dispose of everything properly. Simple as that!